Looking for a dinner place to impress your date? Whisk her away on a buggy through a gorgeous garden; wine and dine her with gourmet dishes while admiring the spectacular Singapore skyline and marina view, followed by a fairy-tale post-meal excursion to an exotic garden! All the above is made possible at POLLEN, Gardens by the Bay. 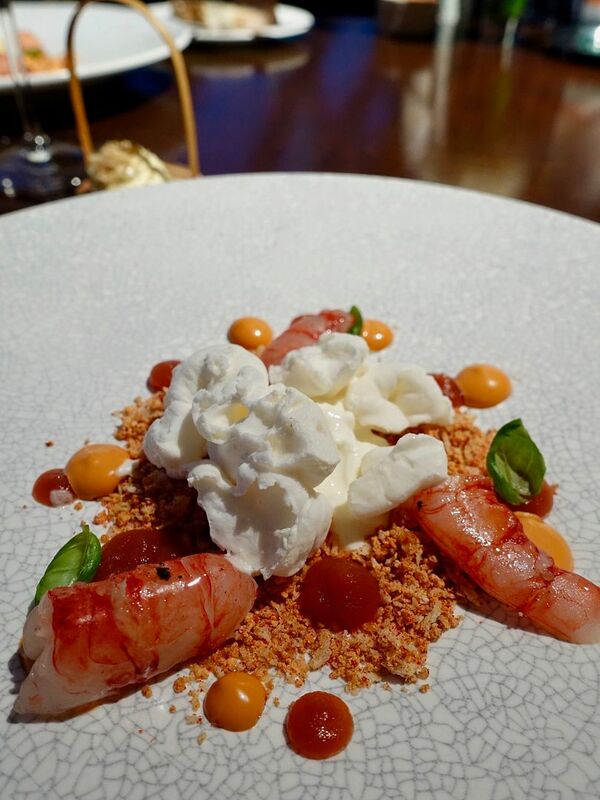 Executive Chef Steve Allen (previously from 1 Michelin-starred restaurant Gordon Ramsay at Claridge's in London) serves French-Mediterranean cuisine, with inspiration draw from South-East Asian chefs and regional agriculture. Two light snacks were served to start the meal- Mushroom Tapioca Cracker flavored with an onion, cèpe mushroom and feta mousse; and a smooth Chicken Liver Parfait with Beetroot Jelly. 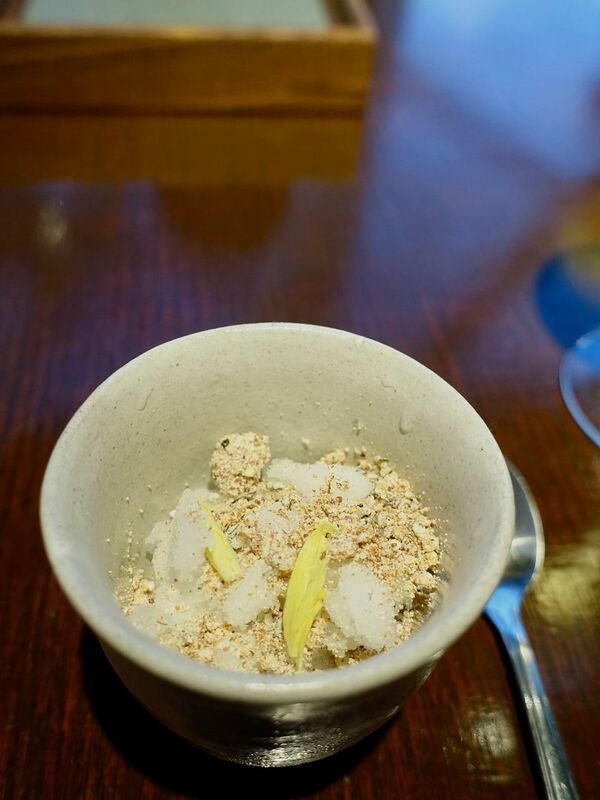 The amuse-bouche of Celery and Seaweed is inspired by Sussex pier (chef's Brit) and features the flavors of the sea with cold briny flavors from the cured mackerel, furikake, and a crunchy seaweed sand made of brown butter solids. The celery was presented in a sorbet form, without the pungent flavors of the smelly veg (hate it but that's me). We had the Red Prawn Tartare, Tomatoes and Burrata ($39). The flavor of the sweet prawn was accentuated with a freshly made prawn mayonnaise. More umami was added with a creamy tomato consommé sorbet, slightly spiced tomato ketchup, and balanced with a milky burrata. For a starter, I highly recommend the Salted Egg and Pumpkin Sabayon ($32), with Joselito ham, dukkah, and pickled apricots (on the a la carte menu). The dish contains all the elements of a typical Teochew porridge meal, presented in French fine dining form. The creamy rich sabayon is balanced with the salty egg white, sour apricot, and smoky ham. Onto heartier mains, we are fans of the Salmon with ikura, green apple, and radishes. This Norwegian salmon is first prepared sous vide before being torched. The meat was perfect blushing pink in the center and I actually preferred eating it on its own than with the accompanying sides. 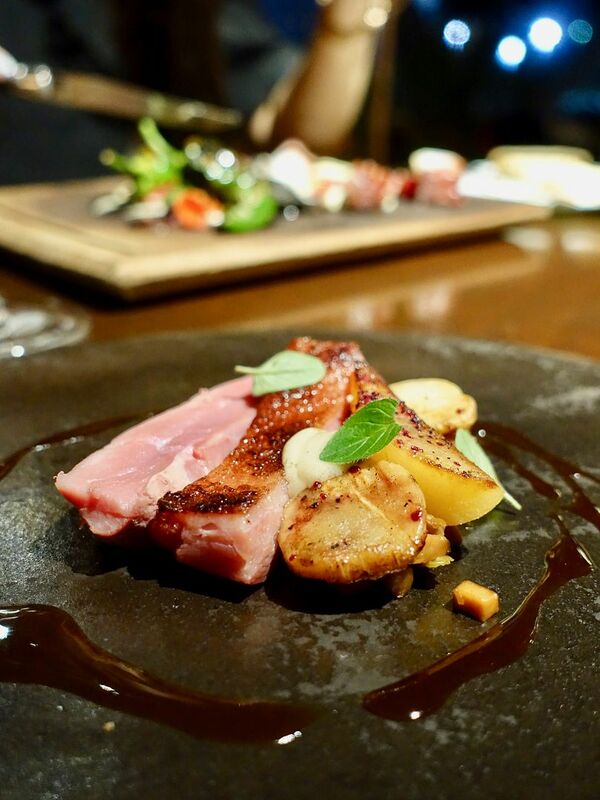 For real meat (fish is not meat IMO), we adored the Poached and Roasted French Duck. The meat is marinated in Asian spices before being roasted and drizzled with an anise jus. The pear and celeriac gave the dish a sweet touch that complemented the spices. The Roast Pigeon from France is paired with the typical pan-seared foie gras, juicy beetroot and cèpe mushroom. The pigeon is one of the best ones I've had in my life this far. The meat is extremely tender and smooth, with a texture like liver (without the powdery bits). For robust Mediterranean flavors, have the Grilled Octopus Leg with padron peppers, bagna cauda (vegetables dipping sauce), and tomatoes (on the a la carte menu $54). Love the crispy char on the tentacles, tender meat, and all the cream and spice. Desserts were made of all my favorite things! Pumpkin is such a versatile fruit and the light natural sweetness and creamy texture when puréed makes it a perfect ice cream ingredient. In the Pumpkin, Yoghurt, White Chocolate, Blueberry ($18), Chef added yogurt powder, and blueberries for some tartness (and dehydrated berries for some crunch). 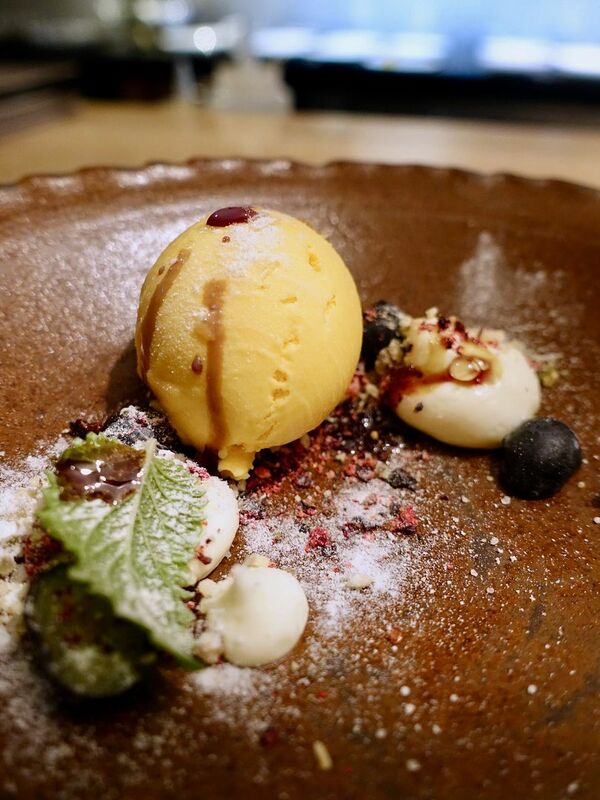 I think it's indecent not to have chocolate for desserts and the Valrhona Chocolate Ganache with pineapple-beetroot sorbet, milk ice (tasted like condensed milk), and pistachio brittle certainly satisfies without being cloying. Pollen's offers lunch and dinner menus and these are from the 7 Course Dinner Tasting Menu ($168/pax) which is available from 6 to 9pm daily. Items that are priced in the post are also available on the a la carte menu. Pollen provides complimentary buggy service and entrance to the Flower Dome if you dine with them.